Lakefront Hide Away..Hot Tub, Views, Comfort, Fire Pit, Canoe, Dock, Etc. Escape to this lakefront home on Flathead Lake. 2 bedrooms, plus den and one bathroom. The home has spectacular views of the Lake and Rocky Mountains. Enjoy 68 feet of your own very private beach. You can boat, swim, sail or fish right off your beach and dock. There is a covered boat lift which can hold a boat up to 2500 pounds. A picnic table, lounge chairs and fire pit are at the waters edge for your relaxation and enjoyment. Loaner canoe on the beach that you may use. Roast marshmallows in the evenings around the lakeside fire pit or up at the house kick back on the large deck, fire up the gas grill and get something to drink while watching the sailboats sail by for the bi-weekly regatta. Or just take a relaxing soak in the outdoor hot tub. 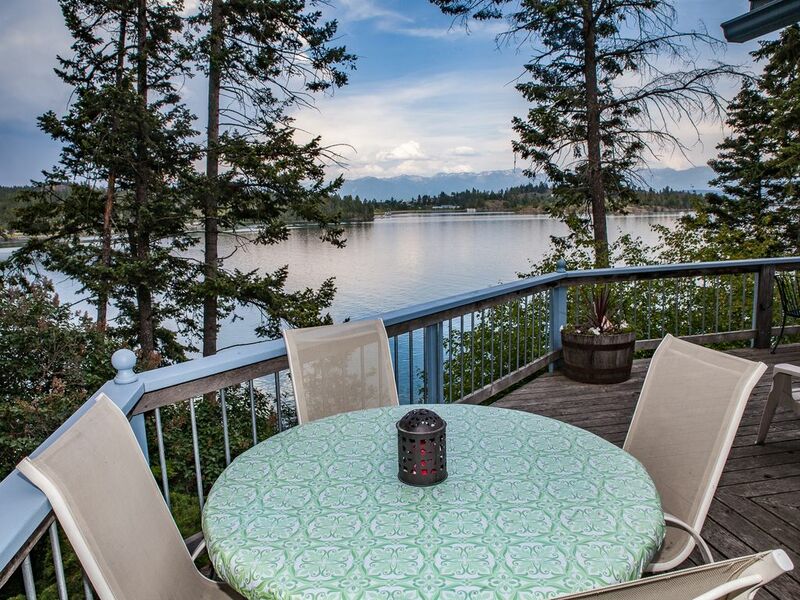 Located on the North end of Flathead Lake this home is the perfect location for your vacation. A number of good restaurants are close by. Within a short drive are nine golf courses, antiquing, art galleries, and live theater, shopping and dining. The National Bison Range, hunting, horseback riding, biking, water slides and hiking in the Jewel Basin and hundreds of other places are also in the area. Glacier National Park is less then an hour away. Take a day trip to one of the most spectacular places in the Rocky Mountains for hiking, sightseeing, taking pictures or whitewater rafting. Don’t forget to get some huckleberry ice cream while you are there. Bigfork is ten miles to the East, Lakeside is four miles to the South, downtown Kalispell is nine miles to the North and Whitefish is 24 miles to the North. The home is 1600sf. On the main level is the fully equipped kitchen, dining room, living room, bathroom, laundry room and the large master bedroom. The spacious deck is also on the main level. The master bedroom has a California King bed, twin pull out couch, TV and sliding glass door that opens onto the deck. The living room has a queen sized hide-a-bed. Downstairs are two additional rooms. One of the rooms has a queen sized bed and a door to the outside. The other room has a double sized hide-a-bed couch and a twin bed. A portable crib and high chair or booster chair are available upon request. TV/DVD/VCR/Cable and loaner movies are in the living room along with an ipod base. Wi-Fi is available throughout the home. There are stairs (9 steps) to get from the parking to the home. There are stairs from the home to the private beach (53 steps). This home is not for everyone as there are stairs to get to the home and stairs to get to the lake. The home has one toilet in the home. The shower in the bathroom is small. However, there is a larger area outside of the toilet and shower room that has another decent sized vanity, sink, mirror and bath tub. During the months of July and August I have a portable toilet in the parking area so that there is another toilet available. The stairs to go to the downstairs rooms are narrow. With that said, if you choose to rent this home knowing these things, you will not be disapointed by the views, the lake front, your own private hot tub on the deck and comfort of the property. My husband and I moved to the Flathead Valley from California. We were drawn to the area to partake of all the many year round outdoor opportunities. We have three lovely girls ages 13, 11 and 4 years old along with some family pets. We hope that you enjoy our little piece of Montana paradise. We think that the location of our vacation home is special. It is close to Kalispell, Lakeside, Somers, Bigfork, Whitefish and only an hour from Glacier National Park. Along with the location of the home comes the wonderful views of lake, Flathead mountains and the quaint town of Somers. Plus the home comes with a canoe on the beach. What could be more enjoyable than a early morning or evening canoe rides? We love to see the bald eagles and osprey as they swoop down on the lake to catch fish for their young. We also enjoy watching the bi-weekly sailboat regatta from the deck. The sunrise is spectacular. Sun pours in the home. The alpine glow sunsets are lovely. One of my favorite things about the beach is how private it feels. For my girls I like how part of the beach glides gently into the water and is great for swimimng and how the other part of the beach is a rock wall. Smores around the fire-pit are also a favorite. After a day of fun in the Flathead Valley, nothing beats a soak in the outside hot tub. One toilet in the home. Overflow bathroom area with vanity, sink, mirror, hair dryer. A/C Floor unit in the Living/Dinning Room area. The other rooms have fans. The rental was very welcoming, and every time you stepped in you felt at home. The location couldn't be better. Gorgeous lake views!! Definitely looking forward to staying here again sometime in the future. Great view, great location, great amenities, great communication with owner - nothing but positive. Enjoy your stay! Beautiful views. Loved being on the water. Stairs gave a good workout. Perfect for the two of us. This lakefront home was everything we could have wanted. Clean comfortable with everything that we could want to make our stay memorable. Beautiful lake and mountain views. Enjoyed every minute! This house worked great for us. We have an infant and were glad they had a baby gate in place above the stairs, a high chair, pack and play, and a few fun toys for our little one to play with. Quiet Hours are 10:00pm - 6:30am. Please be respectful of our neighbors. I encourage you to purchase travelers insurance so that you are covered if you need to cancel your reservation. No Smoking. Check in 4:00 pm Check out 10:00 am. Cleaning fee may be less for shorter stays and smaller group sizes. Please inquire The boat lift holds a small boat up to 2500 lbs. If there is a wind from the south and the waves get big and/or continual, I strongly recommend that you trailer your boat. Otherwise damage may occur to your boat and our dock. The wind on Flathead Lake can pick up unexpectedly.